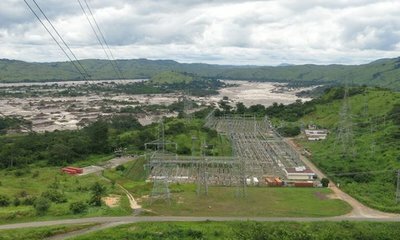 The hydropower exploitation of the Inga river is a complex power generation scheme, which comprises the Inga I and Inga II hydroelectric facilities (already been built), the Inga III, and finally the Grand Inga. The first two schemes were constructed respectively in 1972 and 1982 and provide today the largest amount of grid electricity, despite their poor maintenance conditions. The third one is still at exploration stage, as the first phase in the construction of the 5 dam complex Grand Inga hydropower scheme, located 225 km from Kinshasa, and 150 km upstream of the mouth of the Congo into the Atlantic Ocean. The dam complex has an expected generating capacity of 42,000 MW, with 52 turbines each with a capacity of 750 MW, which will make it the world’s largest dam in terms of hydro-electric production. This is more than Congo can use today and much of the energy will be exported. It would be developed in seven phases beginning with Inga 3, which itself would have two phases. According to International Rivers, its two components would displace about 35,000 people (10,000 for Inga 3 “Basse Chute” and 25,000 for Inga 3 “Haute Chute”) . In addition to building the dam wall and Inga 3 hydropower plant by 2022, the project proposes a power line that would stretch more than 5,000km from the project to South Africa, through Zambia and Namibia. The costs are estimated around $14 billion only for Inga 3 and between $100 and $150 billion for the entire Grand Inga complex. Plans for the Inga dams date back to the '50s, when investors from France, Belgium, China, Brazil and also some African countries expressed interests. In 1972 and 1982, the Mobutu government of the Democratic Republic of Congo, then called Zaire finalized the construction of the first two schemes, Inga 1 and 2, with a total potential generation capacity of 2,132MW. Up to now, these two schemes have never operated to full capacity; according to International Rivers, in 2013 the dams were reported to have produced only 40% of their capacity. From Congo, Rudo Sanyanga, Africa director of the International Rivers, reported last May 2016 that "civil society and the government have wildly different views of Inga 3 and Grand Inga. [...] many suggest that it is the only vehicle that will spur meaningful development in the country and encourage economic interest in the continent as a whole. [...] The government is also fiercely proud of the fact that the DRC has the largest potential for hydropower in Africa — estimated at over 100,000MW including the mighty Congo River and small microhydro sites in smaller watersheds around the country. The Inga site alone has a potential of 50,000MW,"
Project Details The Grand Inga scheme would have a generation capacity of 40,000MW and would be developed in seven phases beginning with Inga 3 (of 4,800MW), which itself would have two phases. Its two components would displace about 35,000 people (10,000 for Inga 3 “Basse Chute” and 25,000 for Inga 3 “Haute Chute”). Inga III would be a new dam located less than a mile from the first two. It would have a relatively simple run-of-the river design; such dams don’t store water like traditional dams. Instead, in Inga’s case, the dam would divert water from the river to a neighboring valley, through turbines, and then back into the river. Company Names or State Enterprises Sinohydro Corporation Limited (Sinohydro) from China - The company is still a bidder in the project as of August 2016. Other Transparency International, in its annual Corruption Perceptions Index, ranked RDC as one of the world’s most corrupt countries and stated that the country suffered one of the most deadly conflicts of the twenty-first century. Development of Alternatives There is a growing lobby within and outside the DRC that holds that a widely distributed series of small renewable energy projects is more sensible. International Rivers hold that "The potential for microhydro is there, [...] The recently published Renewable Energy Atlas for the DRC  clearly shows the tremendous potential renewable energy options for each of DRC’s 11 provinces. Such energy projects would be much cheaper and quicker to build, and would supply electricity to more communities and households spread through the country much sooner than Inga 3 ever could. The national grid network is antiquated and not extensive enough, but microhydro does not need to rely on it to begin supplying power locally. Unfortunately, there is insufficient effort to obtain financing for renewable energy projects." Why? Explain briefly. Although the World Bank announced its withdrawal from the project, other founders are still in. International Rivers - Whose Dream is Inga 3? Al Monitor - Will the Democratic Republic of Congo be Egypt's newest ally in dam disputes?